Swing trading with Market Timing Intelligence! Sign up for a FREE Webinar Sign up in only 60 seconds. The truth is that there aren't any secrets to trading; just proven principles! The most important element of a successful swing trading approach is market timing of both entry and exits. In this educational webinar, you will learn to predict, identify, and trade short-term swing trades in futures, stocks or forex using a unique swing trading “market timing intelligence” methodology. Veteran futures trader and best-selling author John Crane will show how he combines his highly acclaimed “Action/Reaction” market timing methods with a selective set of Elliott Wave and Fibonacci principles to analyze the market action and project future market swings. Simply put, “Action-Reaction” swing trading strategy provides the tools to take advantage of the entire trend, where other strategies are forced to wait for the trend to mature. “Action/Reaction,” combined with Market Timing Intelligence, is the only strategy to give you all three essential components - market direction, price projection and trade duration - needed for a successful swing trade. The “Action-Reaction” signal pattern has the unique ability to identify the “ sweet spot” where a market is building energy inside a trend that can precede explosive market moves and capture the entire move, from beginning to end! It does not matter what market or what time frame you use! While most traders put their emphasis on timing the entry, “action-reaction” puts just as much emphasis on the exit. The wrong “exit” strategy can ruin a good trade, while the correct “exit” strategy can turn a marginal trade into a successful trade. Unlike other swing trading strategies that only give you half the information needed for a successful trade signal, “Action-Reaction” swing trading provides all the information necessary for a swing trader to succeed. Sign up now for a FREE Webinar! Identify low-risk support and resistance levels that appear on every chart, yet most people don’t even recognize them. 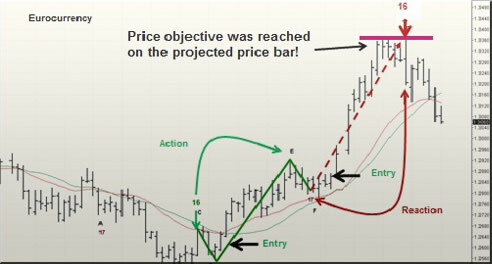 Identify the “sweet spot” where a market is building energy inside a trend that can precede explosive market moves. John Crane has laid out a clear and concise tutorial so you can quickly learn these powerful strategies and quickly begin to use one of the most powerful swing trading strategies available today. Sign up today, for the free “Swing Trading with Market Timing Intelligence” webinar illustrating this powerful strategy. A 30-day free subscription to the Traders Market Views – Swing Trading Report, now in its 23rd year of publication. The Traders Market Views Swing Trading Report is the only newsletter that provides detailed swing trading opportunities using “Action-Reaction” combined with the Reversal Date Indicator. Access to free telephone or e-mail assistance from a highly trained staff to assist you with any questions. This is a limited-time offer, so sign up today for this incredible offer! This material has been prepared by a sales or trading employee or agent of Traders Network, Inc. and is, or is in the nature of, a solicitation. This material is not a research report prepared by Traders Network’s Research Department. By accepting this communication, you agree that you are an experienced user of the futures markets, capable of making independent trading decisions, and agree that you are not, and will not, rely solely on this communication in making trading decisions. The risk of loss in trading futures and/or options is substantial and each investor and/or trader must consider whether this is a suitable investment. Past performance, whether actual or indicated by simulated historical tests of strategies, is not indicative of future results. Trading advice is based on information taken from trades and statistical services and other sources that Traders Network Inc. believes are reliable. We do not guarantee that such information is accurate or complete and it should not be relied upon as such. Trading advice reflects our good faith judgment at a specific time and is subject to change without notice. There is no guarantee that the advice we give will result in profitable trades.